A wonderful melange of poultry, meats, vegetable and rice. A Spanish tradition and a national dish. The Spaniards are geared up for this dish, so they can make it outside or inside depending on the particular festivity. No matter where you have it, it will be different each time and always delicious. I have had many comments on the recipe, most of them good. The negative comments are usually that "it is not a true paella". I have spent quite sometime in Spain, North and South, and I've never had paella the same way twice. It was always delicious, but sometimes there was seafood, and sometimes there was only chicken and sausage. Sometimes the rice was on the crispy side and other times not. 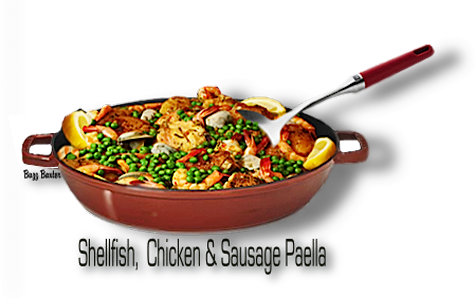 I think that traditional foods like paella are what the cook likes to make, and what ingredients are readily available. I think that is what cooking is all about. Most cooks who are familiar with what goes into a dish will be able to substitute for an ingredient or ingredients that are not fresh or readily available. If you happen to live in an area where fresh shellfish is not available, ......I think you know this is where a substitute would be the better part of valor. almost all the liquid has evaporated. Set aside. 1. Pat dry the chicken and season it with salt and pepper. 2. In a large deep ovenproof skillet heat the oil over moderately high heat until it is hot. until it is browned lightly, and transfer with a slotted spoon to the plate. 1. Preheat the oven 400°F. tumeric and let the mixture steep for 5 minutes. the cilantro and lemon wedges. NOTE: ALTHOUGH NOT THE EXACT RECIPE SHOWN HERE,  THE VIDEOS BELOW SHOULD BE OF HELP.